Whereabouts do you look when you want to order replacement HP LaserJet 4350 toner cartridges? To order a wide choice of discount toner cartridges for HP LaserJet 4350 printers, you can get everything you are ever likely to need and more here on Cartridge Save! It's our core belief to only feature printer toners which are the leading quality for your printer. For LaserJet 4350 laser printer supplies you just never have to keep worrying about, order at Cartridge Save today. Our business is really serious about delivering value for money with terrific customer service. You'll be provided with free delivery with every product that you buy at Cartridge Save. We consider quick delivery very seriously, which results in 98% of all orders getting delivered the following day. Have satisfaction when you place an order with Cartridge Save because of the cast-iron refund policy. In case you experience problems with your HP LaserJet 4350 toner cartridge inside 12 months after purchase just post it to us for your 100% money back. 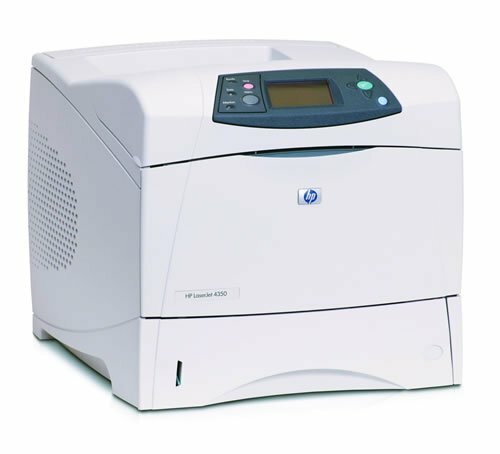 A basic monochrome laser printer built for mid to large volume printing tasks, the HP LaserJet 4350 is one of the most reliable and fastest mono-laser devices commonly used in mid-size to large offices. The LaserJet 4350 printer can handle demanding and heavy duty printing, while still offering excellent quality text and graphics. The HP LaserJet 4350 offers expandable paper capacities but can only handle up to legal-size media, which is why those in need of a wide format printer will have to find a more capable device. Measuring only 19.6x16.5x21 inches, the HP LaserJet 4350 mono laser printer is still compact enough even for an office with a limited space. Built for heavy-duty use, the machine requires high-capacity cartridges, the largest of which can produce up to 20,000 pages before needing replacement. It can be upgraded to a networkable model. However, being the base model, the HP LaserJet 4350 only offers basic mono-laser printing functions and standard paper capacity. The HP LaserJet 4350 laser printer shines best in terms of print speed, boasting an average of 55 ppm. The HP 4350 LaserJet offers excellent print quality, especially when it comes to text documents. With its expandable features, this device is the perfect choice for growing businesses and those with consistently large-volume printing tasks. While the HP LaserJet 4350 printer is considered one of the fastest of its kind in the market, the LaserJet 4350 still only offers monochrome printing and lacks the versatility of multifunction printers. The HP 4350 laser printer is also limited to printing on small-format media.